The Firebase platform is a perfect fit for your Angular 2 web or mobile application as it offers various useful backend services as real-time database, storage, notification, authentication etc. 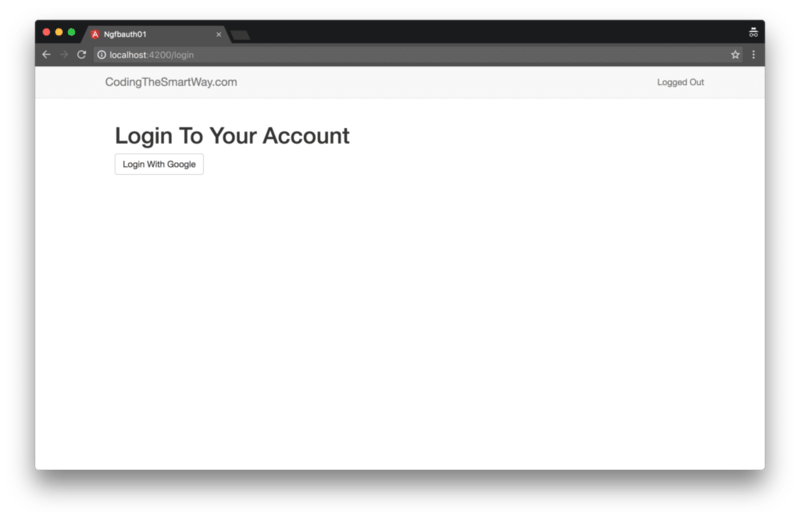 In this tutorial you’ll learn how to make use of the Firebase authentication service in your Angular 2 application. We’ll start from scratch and develop a sample application step-by-step. Authentication is a common task for most web and mobile application. By using the Firebase authentication service, authentication functionality can be easily integrated in your application. The Firebase service can be configured to make use of various authentication providers like Google, Facebook, Twitter or GitHub. By using those providers the user is able to use existing web accounts to sign in. Let’s first take a look at the sample application we’re going to build in this tutorial. 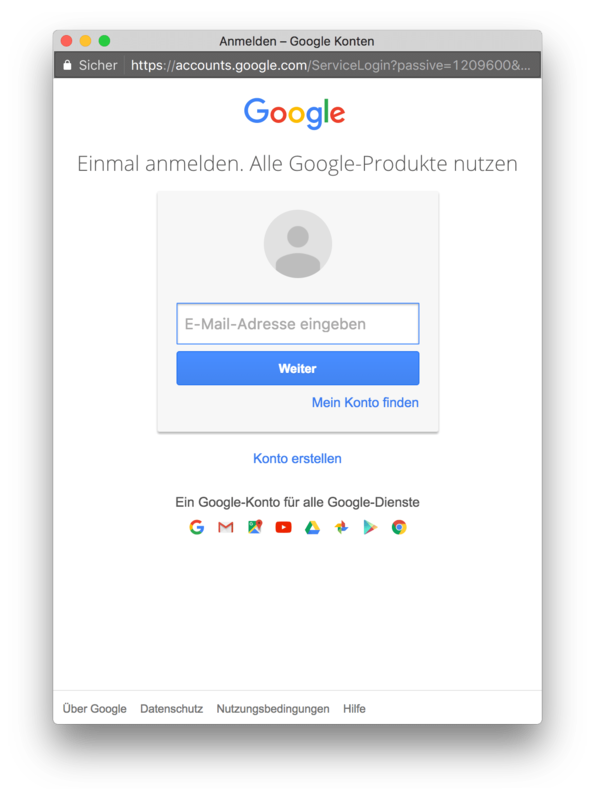 Clicking on the button “Login With Google” opens up the following pop-up window, so that the user is able to enter the credentials of an existing Google account or sign up for a new Google account. Trying to access the home page without being logged in takes the user to the login page. For AngularFire2 to work we will also need to install typings and typescript. Our app should now be visible from a browser on the default url http://localhost:4200. 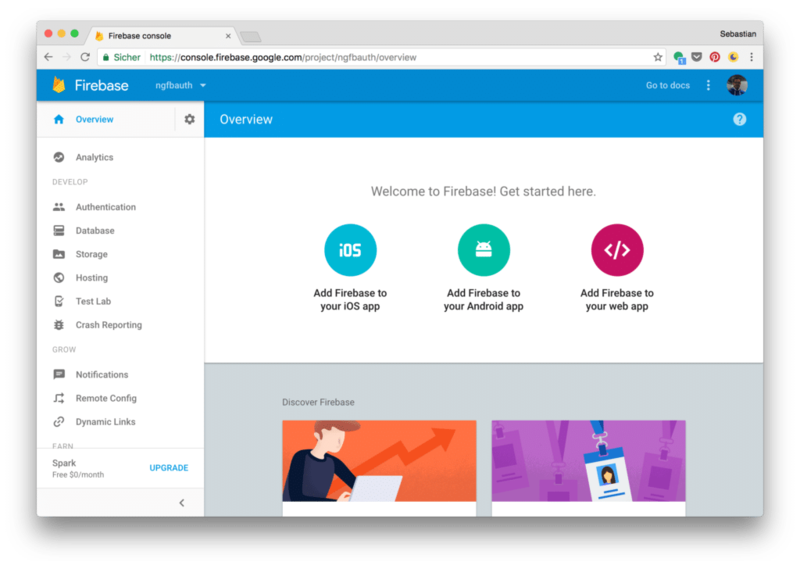 In order to be able to make use of the Firebase authentication service, we need to set up a new Firebase project first. This step is done in the Firebase backend which is called Firebase console and available at https//console.firebase.google.com. Running this command makes sure that both libraries – the Firebase core library and the AngularFire2 library – are added as dependencies to package.json and are downloaded to the node_modules folder. Note, that we’re adding the AngularFireModule to our application by calling the factory method initializeApp and passing in a configuration object. This firebase configuration object consists of a set of properties (apiKey, authDomain, databaseUrl, storageBicket, massagingSenderId). 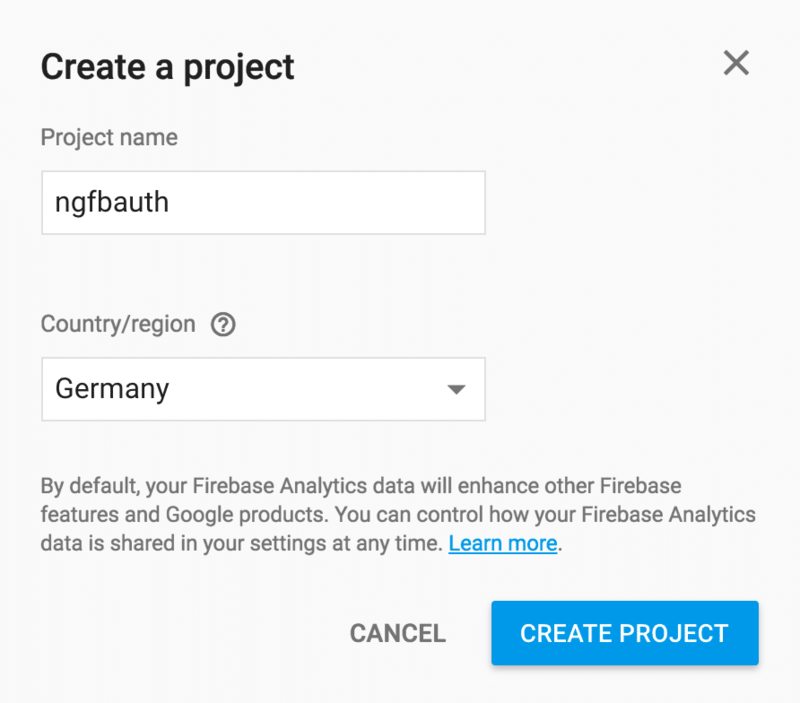 These settings are specific to the Firebase project and can be retrieved from the Firebase console. 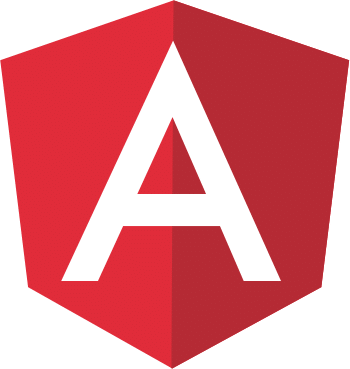 We need to import AngularFire, AuthProviders and AuthMethods from the AngularFire2 library first. Next, the AngularFire service is injected into the constructor of the service. By using the public keyword we’re making sure that a public class member is created at the same time, so that the service instance is accesible from inside and outside of the service class. The loginWithGoogle() method is used to call the login() method of the auth object of the AngularFire instance. This login methods expects to get an configuration object which describes which authentication provider and which authentication method should be used. As we would like to use Google authentication the value AuthProviders.Google needs to be assigned to the provider property. When invoking the authentication process we would also like to display a pop-up window for signing in to the user. To achieve this application behaviour we need to assign the value AuthMethods.Popup to the method property. The logout service method only consists of one line of code. We’re calling the method logout of the auth object of the AngularFire object to make sure that the user is logged out. The providers property expects to get an array assigned. This array contains all service providers which should be made available. In our case this array contains one element: AuthService. Note, when we’re using Angular 2 CLI to generate a new component, that component is automatically added to AppModule. The login() method is implemented to make use of AuthService to initiate the Google login by using the service method loginWithGoogle. As this method is rerturning a Promise we can attach the then method to wait for the promise to be resolved. When the promise is resolved, we’re using the Router service to navigate to the default route. The router configuration will be added later to to our application. Next let’s add another component to our application: HomePageComponent. This component should be displayed when the default application router (/) is requested. Displaying this view should only be possible if the user is logged in. If the user is not logged in, he or she should be redirected to the LoginPageComponent automatically. The routes array consists of two Routes objects, one that connects the default route (/) with component HomePageComponent and one that connects route /login with LoginPageComponent. This router configuration is activated by passing the configuration object to the factory method Router.Module.forRoot() and adding the returned RouterModule to the imports array. isLoggedIn: If logged in, isLoggedIn is set to true, if not to false. user_displayName: If logged in this class member is set to the display name of the user account. user_email: If logged in this class member is set to the email address of the user account. If authentication information is available the user is redirected to the default route, so that the output of HomePageComponent is shown. If no authentication information is available the user is redirected to the login route, so that the output of LoginPageComponent is shown. The template contains a Bootstrap navigation bar. Within the navigation bar the template contains code to print out the authentication status. 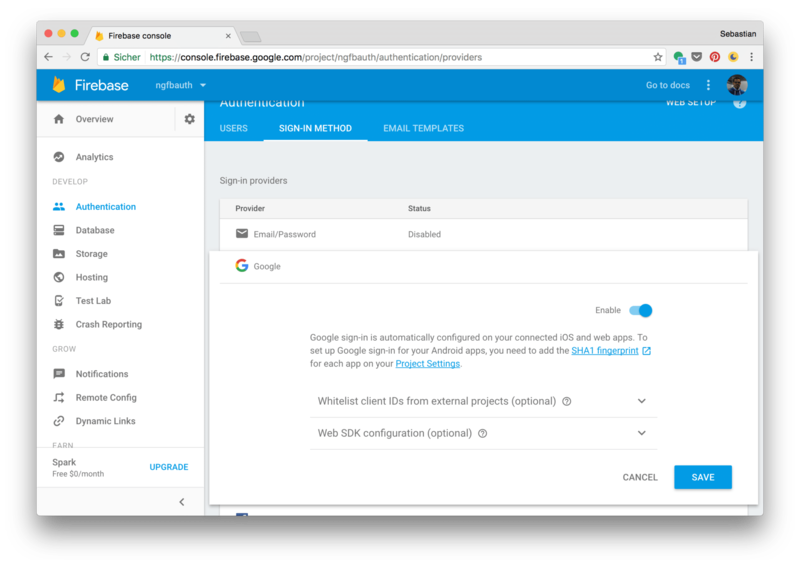 The Firebase authentication service makes it easy to integrate authentication functionality in your application. It support various authentication providers (like Google, Facebook, Github etc.) which can be activated and configured in the Firebase console. This makes it easy to use existing web accounts for authentication in your web or mobile application.